Throwing a 4th of July party this year and need ideas for pretty flowers that you can set out on a table? 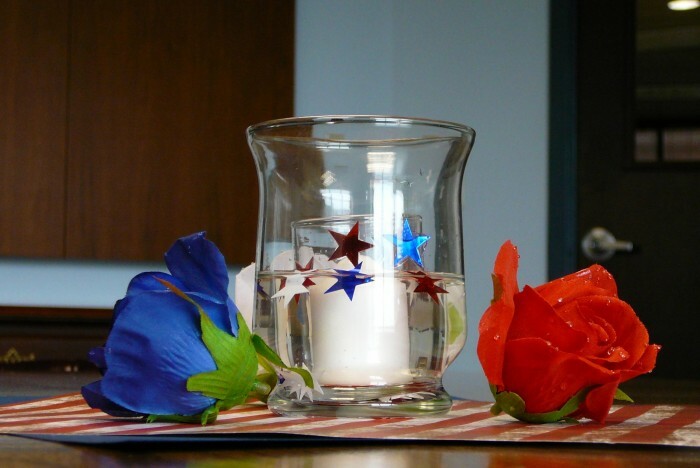 Looking for flowers that you ca incorporate into your 4th of July food spread? We have some suggestions for you, and of course they focus on patriotic red, white, and blue. If you need to decorate a table or counter for the 4th, or adorn a festive cake or cupcake, consider the following beautiful flowers flowers. Carnations are cheerful and fun flowers that you can buy in red, white, and blue. They’re easy to find in most grocery stores and in garden centers before the 4th of July. These puffy floral balls remind us of the bursting fireworks that we watch every 4th holiday. Carnations are perfect for a 4th of July celebration because they don’t need much care (throw them in a vase a few days or even a week before your party), which means that you have more time to take care of the other details of your gathering. Carnations are not edible though, so if you place them on food, take them off before consuming your goodies. And, don’t float carnations in any punches or sangrias you might make. Roses, on the other hand, are edible (but not the dyed varieties) and they’re great in drinks or baked goods. Place red and white roses in a rose water lemonade or mix them into a cool rose ice cream. For décor, place red and white roses into a vase and then tie a shiny blue ribbon around it. You’ll have a gorgeous centerpiece for an indoor or outdoor soiree. In addition to carnations and roses, you can always present a mixed bouquet of red, white, and blue flowers like dahlias, snapdragons, and gerbera daisies. Don’t eat any of these flowers though. Simply enjoy them for their stunning good looks.